Does Your Bible Have An Asterisk? In a random illustration of my Easter sermon I asked a question. I quoted Philippians 4:13, “I can do all things through Christ who strengthens me.” Then I asked. Or. Does your Bible have an asterisk? *—Well, maybe two. Yeah, there is that one more thing. *—Honestly... I think there is a whole lot God can’t do in or through me. 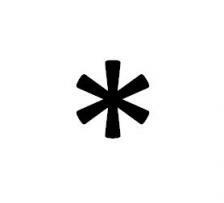 Where have you mentally inserted an unbelieving asterisk? What Scripture stops you cold? How is your practical atheism revealed? Why can't you fully trust God to be & do what He says in the Bible? *—Except leave that worrisome situation in God's hands alone. *—Except to accept God’s forgiveness and move beyond shame.